The Oregon and Washington departments of Fish and Wildlife have placed a trap at The Dalles Marina on the Columbia River to try to capture California sea lions that have made their way above Bonneville Dam. The animals apparently made it upriver past the dam through the shipping locks used for boat and barge traffic. The new live trap was built and set at the request of the four Columbia River Treaty Tribes who fish above the dam. California Sea Lions above the dam have taken a toll on the tribal fishing and tribal fishing gear for three years. The tribes rely on the revered fish for both food and in traditional ceremonies. "Tribal fishers have grown frustrated with the sea lions above Bonneville Dam and the damage they cause to their fishing gear," said Paul Lumley, the executive director for the Columbia River Inter-Tribal Fish Commission. "We are happy that something is being done to address the situation and remove the animals that have become stuck in the Bonneville Pool and confined by Bonneville Dam." 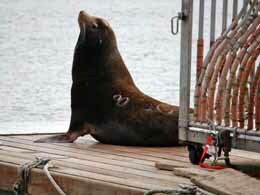 At least three sea lions have been seen in the area of the marina. Once trapped, each animal would be removed from The Dalles area and later individually examined for brands or natural markings. Those would determine if they are on the list for removal. Unknown animals that are not marked would be branded and released into the Columbia River below the dam. Marked animals on the removal list would undergo a health assessment and, if those meet health criteria, could be considered for transfer to the Queens Zoo in New York. Marked animals on the removal list could be killed. Trapping sea lions above Bonneville Dam is authorized by the National Marine Fisheries Service as part of the states' efforts to protect threatened and endangered fish populations from the growing number of California sea lions in the Columbia.